Does anyone else use GoodReads to keep track of their books or for book recs? Does anyone else use http://goodreads.com/ to keep track of their books or for book recs? I forgot about it for a while, but have started using it again. DEFINITELY. I catalog all my books I’ve read on there. No way alive I’d remember them all otherwise! Yeah. I do the Goodreads Challenge every year. It’s fun to see how many books I read/listen to every year. I also like to track all the books I might want to read someday. Have you tried both? Is Library Thing better? Marize I used Goodreads for a long time. I still have a membership and occasionally get info or post info. For record-keeping purposes, and for member interaction, Librarything suits my needs much better. Not knocking Goodreads–I still have quite a few reviews there–but there were some issues a while back that caused me to try the other. Then I found that I liked it very much. Gail, does Librarything help when you’re actually at the library, see a book and can’t remember if you’ve read it or not? About to google it and see what it’s about. Thanks! Anne Yes. They’ve recently added an app which lists all your lists from the site. Gail, I too love LibraryThing and started using it before Goodreads. I actually still use both. I have found that LibraryThing is more social and sympatico. Love the exchange of ideas and sharing of the love of books through LibraryThing. The book giveaway program in Goodreads is more robust, however. Sadly, when I joined a couple of years back, I didn’t add in all the books I had read previously. Guess who just bought a paperback they’d read previously, that was only mediocre. That’s not so bad. I’ve accidentally bought books I already own! Marize, you’re not alone in that. Hence my TBR list of books already in the house. TBRs that I do not yet own, I place on a “Wishlist-books not yet acquired” in case my bookish friends/family need an idea for birthdays or Christmas. I really like Goodreads. I like my “books read” list and my “want to read” list, as well as the reader reviews. I do.I also love that they send you alerts when a book on your to-read list has a giveaway. Yes. & if you use kindle, the updates are automatic. Yes! Love it! Especially for managing my To Read list. No. I tried it and found it annoying. In 2006 I started keeping a paper list of books I read. I moved to Goodreads a few years later and have added most of those earlier books. I love the scan feature! I do both! It’s really satisfying to cross things out on paper and re-print the list every year. I use Library thing for all the books I want to read, especially library books. Use Goodreads and also use a notebook. I love goodreads. Feel free to friend me! I love Goodreads – have been a member for about 6 years. I couldn’t live without it! I keep track of my reading there. go to http://www.goodreads.com/ and have a look! there are reviews, you can list and rate all the books you have read and it will then begin to recommend books, you can keep a list of the books you want to read (which is very handy – I use the app all the time), there are all sorts of groups you can join for reading. Lots of interesting people. Goodreads works for me. I also love the fact that I can see what my loved ones are reading. Me too. I love scanning the barcode. So much easier. Use http://goodreads.com/ all the time! Hahaha, yes, ma’am, here’s a screenshot: click on “browse” on your desktop version of the site and you’ll see giveaways. Yes, I use it and find it very convenient to keep track of books, a growing TBR list, set goals and read reviews. Yes! Just started using it again. Forgot all about it. Lydia check out this thread! I do and a notebook. Yes, I use it all the time. I frequently check reviews if I have formed a particular opinion of a book to see whether or not I’m the only one! I do but I also have a Pinterest page for each year’s books. Yes all of the time! I use it to set a yearly challenge and add my “want to read” books. What I love is if there is a contest to win a book I have on my list, I get an email to enter. I’ve won a couple of books so far! I do. Love that website. I keep track of books I want to read that I can’t get at my own library. Then when I visit the other library I can borrow from I know what I want to check out. You can sort your “want to read” list by alphabetizing the author which makes it super easy to stroll through the stacks. GoodReads is my best friend. I can’t imagine life without it. Seriously. I use it everyday for updates on what my friends are reading, book reviews & tracking and reviewing my books. I particularly enjoy adding new books to my ever expanding to-read list. I can easily cross reference that list with my library’s holdings. I use it. I’ve won 4 books in the giveaways over the years too! I love it. It is one place in my life that is organized. I thought the same thing Sara. Hang in there and it will happen! Me too. Have never won a thing. On a daily basis, I review the most recently added giveaway books. 94 books have landed on my doorstep through the giveaway program thus far. A few additional books have arrived unbidden with the hope that I will review those as well. I add them to the TBR pile and they eventually do get read too. Do you write reviews of the books you’ve already read or rate them? I write reviews that are a couple of paragraphs long for each giveaway book and generally at least a sentence or two for all others. Whether that helps or not, I cannot say for certain. In all honesty, it took several months of trying before any book was won. Keep trying – it will happen. I probably win 8 to 10 a year. Create a shelf called “giveaways”, and I always log them there. I always do a review and thank the publisher and author for the free book. I have occassionally recieved ones that have not yet been published. When that happens, I also tag them on a shelf called “first reads”, and again thank the author and publisher. I think most of the drawings are random. But I have had correspondence with authors where they admitted they looked at what else I read and chose me because they thought I would like the book. Therese, interesting. I had not heard that before. I suspect they weren’t supposed to tell me me. I have had three authors admit that to me. Well, it makes sense. Why send a book that needs a review to someone who doesn’t appear to read the genre? I love my goodreads…..I record and review books I have read, I look up recommended books, and I share books with friends. I could not live without it! GoodReads is confusing. I have tried for years to use different parts of it and usually give up. I got confused too. But I just read the same 30 books over and over, so . . .
Do you try to put books on it that you have already read? Or just start from where you are right now? I did it years ago. I don’t remember my sign in information. I will try. But I know there no way I can possibly remember all the books I have ever read. Also, if you go to the website, you can find people’s lists of books. I found it helpful to browse those to add books I’d read. There was a lot I didn’t remember reading until it showed up on a list. It’s an initial time investment to enter books you’ve read, but I’m a completionist and I found it worth it. 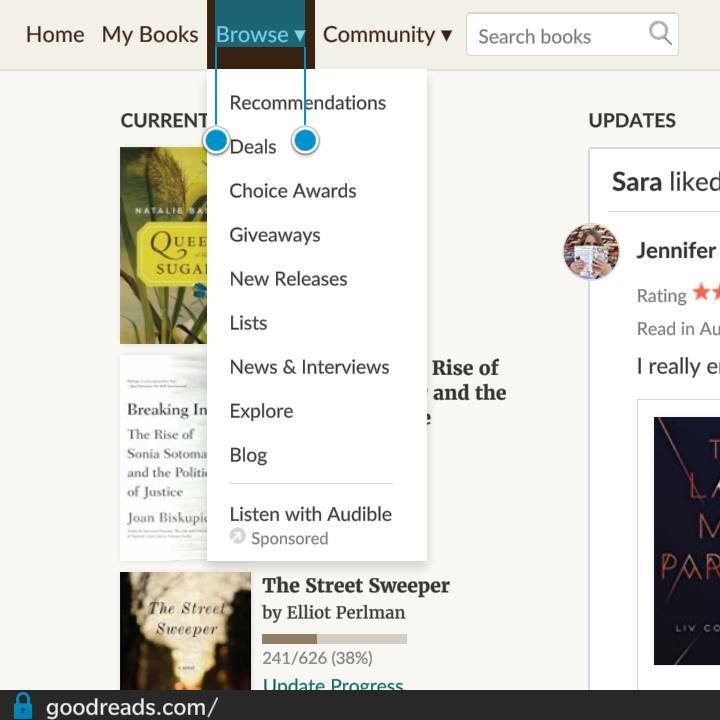 It will also let you liase with your Amazon account, if you have one, and let you add the books you’ve purchased. I found that really helpful. They even have a scan feature in the app for android that lets you scan the COVER of the book and it adds it to you list!! I don’t know why I haven’t did this before now. You all will have to keep me informed of anything book related from now on. I am a cheapskate too. So I will be joining you in that. I have been on Good reads for 2 hours. I use the Chromebook version of Excel. I title it by year, and then the columns are title, author, any notes, and where it came from. That way I can do things like order the author column alphabetically – in case I want to see if I’ve read everything by a particular author or in a series. And yes, I’m OCD so it gives me an opportunity to utilize it in a practical way. It sounds like a lot of work but it becomes very easy. It also was a way around not having internet at home. But my children gave me a smart phone for Christmas so I can now reach the “world” at home! I also use the Goodreads app on my phone at used book sales – I scan the book’s barcode and check the reviews – if it’s not highly rated I don’t buy it. Now this is a great tip to know!!! I love Goodreads. I’ve found and read so many great books. Religiously!! I love the reading goal feature, I’m fairly up to date with 60 as my goal for the year. I love the reading goal!!! I met my goal of 75 last year and upped it to 80 this year. So far, I’m on track. Might even surpass it. It makes me read even more lol. Yes!! It is easy to use plus you can export you right lists at any time. I want to do reading challenges. I was writing down every book i read with a little review in a notebook until i found goodreads…love it. Still write in the notebook though, just in case. I use the app to keep track of books I’ve read & books I want to read!